The US president made the claim in a major speech to staff and guests at the Kennedy Space Center in Florida. "By 2025, we expect new spacecraft designed for long journeys to allow us to begin the first-ever crewed missions beyond the Moon into deep space," he told his audience. "So we'll start - we'll start by sending astronauts to an asteroid for the first time in history." And then he added: "By the mid-2030s, I believe we can send humans to orbit Mars and return them safely to Earth. And a landing on Mars will follow. And I expect to be around to see it." 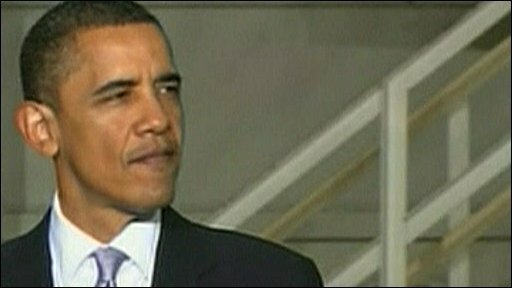 Mr Obama hopes his new timetable for action can win wide approval. The White House has been under fire since announcing in February that it wanted to shut down Constellation, the current programme to replace the ageing space shuttle. 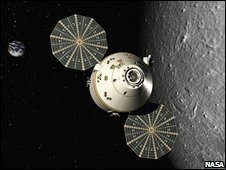 Mr Obama said the proposed Orion crewship, its Ares launch rocket, together with the rest of the project's Moon-bound architecture were on an unsustainable path, costing too much money and taking too long to develop. The president claimed a refocused Nasa could achieve more, sooner than under Constellation. The Orion ship will be remodelled to serve as an ISS "lifeboat"
"What we're looking for is not just to continue on the same path; we want to leap into the future," he said. "We want major breakthroughs, a transformative agenda for Nasa." In the speech, the president did not change the broad outline of the vision for the US space agency he first expounded in his 2011 federal budget request. He still proposes to extend the operation of the International Space Station (ISS) from 2016 until at least 2020; and he re-emphasised his desire to see commercial companies take over the job of launching astronauts to the orbiting platform. However, there was a key concession in the speech. This was a commitment to carry forward development of the Orion crew capsule. In the first instance, this would be just a simpler version of the ship designed to act as a "lifeboat" at the ISS. However, he said in due course this revised vessel would also serve as the "technological foundation" for much more capable vehicles to take astronauts beyond low-Earth orbit. Mr Obama also pledged to begin development of a new heavy-lift rocket no later than 2015, but he said it must contain new propulsion technologies. Mimicking the rockets of the past was not an option, he explained. "The bottom line is: nobody is more committed to manned spaceflight, the human exploration of space, than I am. But we've got to do it in a smart way; we can't keep doing the same old things as before." Addressing fears that changes to US space policy might result in thousands of job losses across Florida's "Space Coast", Mr Obama claimed his ideas would actually create 2,500 more jobs than under Constellation. To emphasise his support for the space programme, he reminded his audience that Nasa was in the extraordinary position of having its budget increased at a time when other areas of government faced static funding or even cuts to try to constrain the national deficit. Money spent on the space programme would reap huge dividends, he argued. "For pennies on the dollar, the space programme has fuelled jobs and entire industries. For pennies on the dollar, the space programme has improved our lives, advanced our society, strengthened our economy and inspired generations of Americans. And I have no doubt that Nasa can continue to fill this role."